Since the surprise announcement in mid October 2009 by the FDA at a meeting of shellfish regulators and industry, telling them that the FDA plans to ban the sale of live, in-the-shell Gulf Coast oysters for as much as 8 months every year, people have come together to speak out against the ban. As of today, November 4, 2009, the number of people that have joined the Facebook group, Save Our Oysters is 1,693 and an astonishing 4,009 people have joined the Facebook group, Save the Gulf Coast Oyster Industry. The website Save Our Shellfish is now online and it is here where people can sign a petition to, "Ask the FDA to stop all plans to implement the Gulf Coast oyster ban, and instead work with the established shellfish regulation system to address public health concerns with improved refrigeration and education programs." Another petition to, "Save the Gulf Coast Shellfish Industry", is online here. Today it has 2,671 online signatures and has set of goal of 50,000. 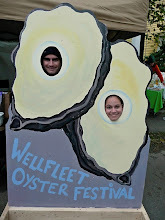 The feud has also launched the recent creation of a Raw Oyster Blog. As I see it, the fuss is now two-fold. It is true that Vibro Vulnificus is a deadly bacterial infection that affects oysters in warm waters, but is also extremely rare. The statistics I have seen recently show that 30 people per year are sickened by Vibro and 13 to 15 Gulf oyster-eaters die each year, nationwide by Vibro. Are these numbers low or high? The FDA says high, as does the owner of Raw Oyster Alert, but most of the rest of the nation says low. And so low "that the FDA should not spend tax payer money on Vibro". The second part of the problem, as I see it, is that the FDA acted unilaterally without input from the industry and state regulators. Cooperative efforts had been taking place for decades, until now. What happens next, I am curious to see. Buy oysters from Taylor. They taste better and don't kill people!